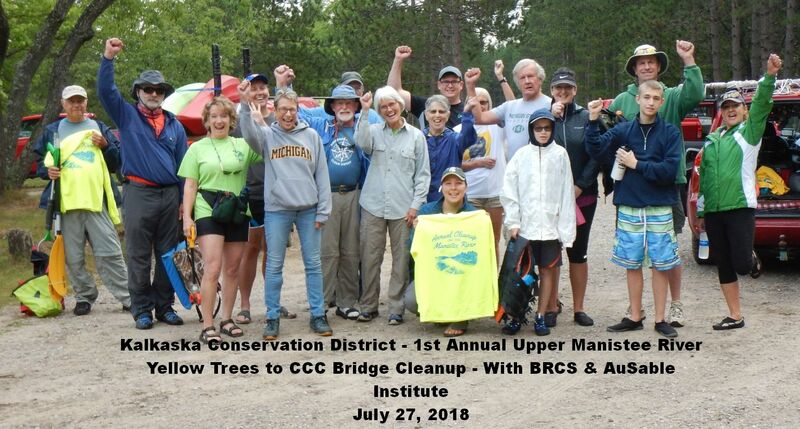 Thank you to all who joined the Kalkaska Conservation District and Boardman River Clean Sweep on our annual cleanup of the Manistee River! When I arrived at the meeting point at 8:28am, I was a bit nervous. With the threat of rain that morning my brain started going into ‘what if’ overdrive. I was able to relax once volunteers started arriving though. My gut was re-assured that I had enough canoes, paddles, pfd’s, & food for everyone. In total 18 people attended the event & made it a success. 2 people assisted on land to help shuttle canoes & the 16 participants on the water. We met at 9am at CCC Bridge off Riverview Rd. The weather was cooler (high of 70 degrees) but threatened patchy rain. Somehow we all stayed dry through our safety meeting and introductions. Rain beat down while we drove up to the launch site at Yellow Trees Rd. Everyone launched about 10am in good spirits to pick up trash from this 7 mile stretch of the river. The Upper Manistee is classified as a wild and scenic river, so it wasn’t a big surprise that we didn’t find much trash along our way. The sweep canoe pulled out at CCC Bridge at 1:20pm. We added all of our new-found treasures together to realize that we collected 2- 13 gallon bags of trash. Some recyclables were separated and the campground was gracious enough to let us utilize their dumpster. All in all, it was a great paddle! There wasn’t much trash to get out and folks got to see quite a few birds (King Fisher, Cedar Wax Wing, Wood Thrush, Mallard momma and babies) and beautiful wildflowers (Cardinal flower, Joe Pye Weed, Elderberry, Ninebark, Boneset, and Blue vervain just to name a few). If anyone wants to join in the fun of our cleanups, we will be hosting another one soon. Saturday, August 4th from 9am to 1pm to cleanup from Rainbow Jim to Lucas Rd (Missauke Bridge). Meet at 9am at Rainbow Jim. We will provide lunch, t-shirts, & canoes. I just need interested individuals to let me know that they want to join by Friday, August 3, 2018 at Noon.